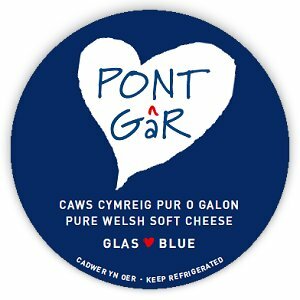 So this week’s COTW, dovetailing with our first DOTM (I can’t move for initialisms at the moment), is Pont Gâr Soft Blue, made by the Camarthenshire Cheese Company (CCC?) in West Wales. It’s a mould-ripened cheese with a little bit of blue veining. But don’t be fooled – there’s plenty of flavour here (I think the round we’re working through must be a well-aged one). The producers suggest baking it to turn it into a dip – great with crusty bread, and I’d suggest a few sticks of celery too.